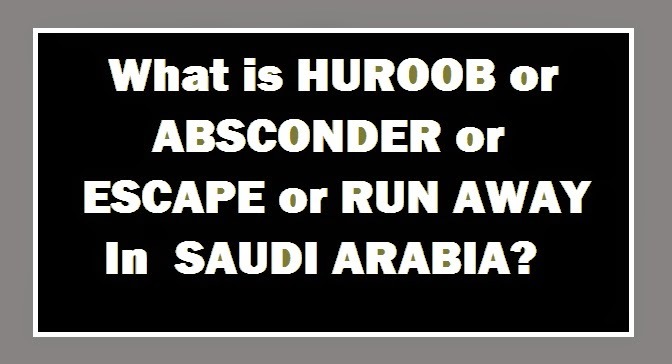 Huroob is an Arabic word which means Escape or Absconder or Run Away (Absent From Work). As per Saudi Labor Law, Employer has to report to passport authorities, If his employee (Saudi Expatriate) is absent from work for a specific period of time to declare him as Huroob (Absconder or Escape or Run Away). - Saudi Residency Permit (Iqama/Muqeem ID) will be canceled. - Illegal for him to stay in the Kingdom of Saudi Arabia. - Benefits and Rights of legal employee will be canceled. - Leave the Saudi Arabia through Deportation centers (Tharheels). - 5 years ban from entering into the kingdom of Saudi Arabia. - 5000 SR for first time, 10,000 for second time and 15000 for third time including one month imprisonment. - Runaway employee shall be deported at employer's expense or if he was working for his own he shall be deported on his own expense. Sometimes employers (sponsors) may misuse Huroob provision, If an employee is going to approach against employer in labor court for any causes like mistreatment, non payment of salary or any other causes. According to Saudi Labor Law, "An employer (sponsor) may not terminate the employee contract without an award (To him), advance notice or indemnity except in the few cases, and provided that he gives the worker a chance to state his reasons for objecting the termination." how can i run away if im still working in this company? they never renew our IQAMA! thats why we never get our salary from bank for almost 4 months!! what shall we do? please help us!!! the company. FIAFIR COMPANY FOR TRADING AND CONTRACTING. the project located at tabuk university!! !